Powder Based Additive Manufacturing (3D Printing): Modelling and Simulation. An amazing opportunity has emerged for an enthusiastic student to work on a joint project between University of Strathclyde Department of Mechanical and Aerospace Engineering (UK) and Macquarie University (Australia). A joint PhD will be awarded upon successful completion of the project and the Student will spend 50% of their studies at Strathclyde and 50% at Macquarie. Although the technology can potentially revolutionise the manufacturing land scape, highly complex and multi-physics nature of the process is hindering the development of the technology and introduction of new materials. As a result, material selection for PBF devices and their design, optimisation and operation currently remains an empirical task which depends on the intuition and ”know-how” of highly skilled engineers. This problem will be tackled by an extended Discrete Element Method (DEM) to allow for including the effects of complex contact and material mechanics in particle based simulations. 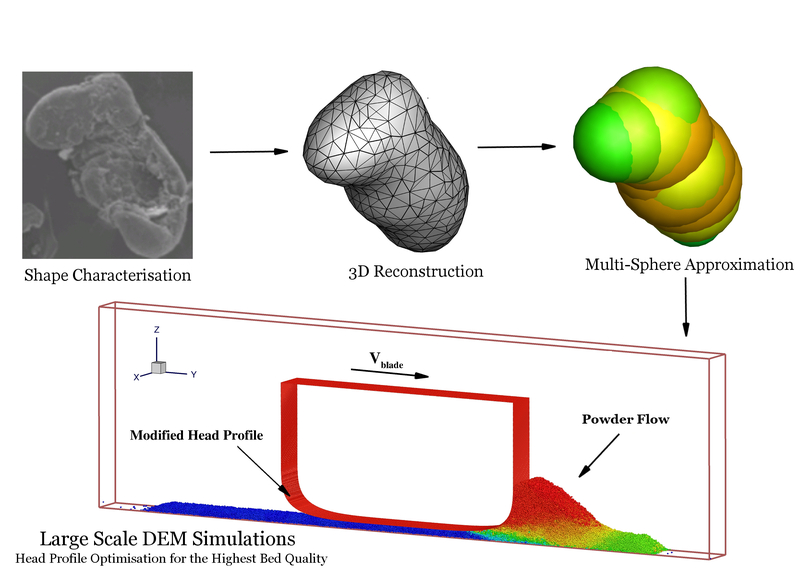 The extended DEM capability enables the simulation of multi-scale phenomena such as sintering and growth and can be coupled with Lattice-Boltzmann Techniques to simulate particle melting. The successful candidate is expected to develop significant expertise in areas of granular flows, complex fluids and High Performance Computing. The student will benefit from the collegial environment provided by the Mechanical and Aerospace Department and in particular, James Weir Fluid Laboratory to thrive in this field and will also have chance experience two international research environment at Strathclyde and Macquarie. This will allow the student to complete their PhD to the highest standards. IMPORTANT: Student will need excellent programming skills or a willingness to learn. Applications from Mathematics and Physics students is also encouraged. Full studentship is available for 3 years and will cover the cost of travel between Strathclyde and Macquarie as well. However, award of the studentship may take a couple of month due to administrative complexities of setting up a joint PhD. IMPORTANT: Note that a full Studentship for the duration of study at Strathclyde is only available for EU/UK nationals. International students need to cover a fee difference during their study at Strathclyde (1.5 years). Please contact Dr Haeri for more details.